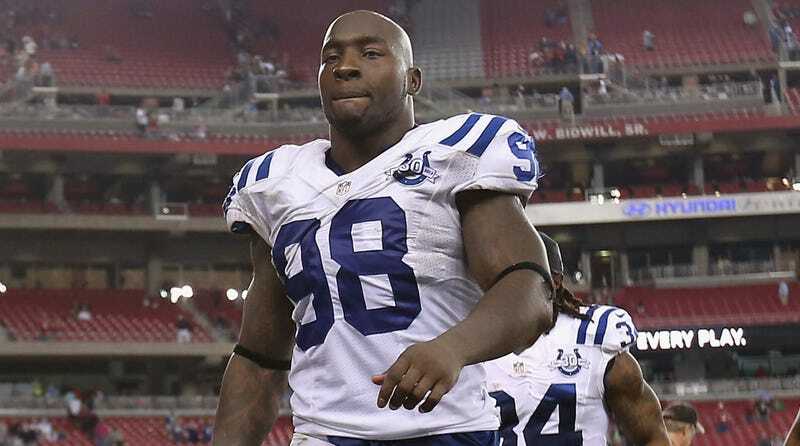 Robert Mathis's agent is not about to let his client's four-game suspension pass without a fight—and the NFL appears willing to engage him. The agent, Hadley Englehard, and the NFL have waged an unusually public war of words for Mathis's violation of the league's drug policy for what he claims was a prescribed fertility treatment. Clomid has legitimate medical uses—though it's not FDA-approved for use in men—and Englehard immediately took the offensive. "The league and Commissioner Goodell have taken a stance that puts Robert under some strict scrutiny. That is really unjust and unfair," Englehard said. "We have given him all the medical data. We are just amazed that the commissioner and the NFL have put this kind of punishment on Robert." Clomid, though, is probably not the hill an athlete wants to die on. It is one of the most popular drugs in the history of illegal performance-enhancing in sports, and has been for decades. Its most popular contraband use is to jumpstart a man's testosterone cycle if it's been interrupted by steroid use, and it shows up again and again in baseball's PED users—most notably in the BALCO scandal. The bottom line: Any player should know to seek a medical exemption before using it. Mathis did not. And more than that, no competent doctor would provide it to an athlete for legitimate medical purposes without warning him that it appears on all banned-substance lists. But the more we learn about Mathis's doctor, the more questions come up. Naptown.co poked around the website for that doctor's clinic, and didn't find any information on fertility treatments. Instead, there's a whole bunch of "anti-aging" treatments, including Sermorelin, a largely undetectable HGH substitute. "As Mr. Mathis's agent acknowledged today, his client failed to follow the protocols in the policy that the NFL and NFLPA agreed upon to address precisely these kinds of claims. That policy also prescribes the disciplinary consequences of a positive test. The policy does not provide — nor should it provide — for the Commissioner to override the policy's procedures and assess discipline on an after-the-fact, ad hoc basis. Here Mr. Mathis actually withdrew his appeal and accepted discipline at the union's suggestion. His hearing took place only after the Players Association requested that the appeal be reinstated. "The drug for which Mr. Mathis tested positive is not approved by the FDA for fertility in males and is a performance-enhancing drug that has been prohibited for years. Importantly, Mr. Mathis did not consult with the policy's Independent Administrator, a physician jointly approved by the NFL and NFL Players Association. Nor did he consult with his team doctor, the team's training staff, the NFLPA, the league office or the hotline established under the policy to give confidential information to players. Each of these sources would have warned against using this substance." Without violating the drug policy, the league managed to pretty effectively bring down the hammer on Mathis. It notes that Mathis took precisely none of the steps available to make sure his prescribed drug was legal, failed to make an attempt to clear it with the league beforehand, and even, initially, withdrew his appeal of his suspension. Yet Mathis's agent was back on the air today, still taking it to the NFL. In an appearance on Mike & Mike, Engelhard blasted the league for A) making a statement on Mathis in the first place, and B) claiming that Clomid has no medically approved therapeutic uses. "They released a statement, which the NFL never does, and even in their statement, they're misleading the public," Englehard said. "There's many drugs that are not FDA approved for certain things and are used for other things, and the doctor, in direct and cross examination, even talked about that: He's been using this as a fertility drug for 20-plus years. There's not one shred of evidence, there's not one shred of testimony, that says anything but, Robert used it not for anything but fertility." I sympathize with Mathis if he was indeed using Clomid solely for fertility purposes, but athletes have sort of lost the benefit of the doubt on these things. It's a player's responsibility to double-check everything they put into their body, especially with a testosterone-boosting prescription drug; this wasn't some over-the-counter supplement. There are very specific avenues for players to clear legitimate usage—and according to Englehard, some players have received exemptions for this very drug—so it's hard to understand why Mathis did not. More than all that, every suspended player has an explanation, and it's never "I got caught using something I knew I wasn't supposed to." Common sense says it's improbable that 100 percent of failed drug tests were honest mistakes, and with each passing suspension, even explanations that might be real start to sound like excuses. Maybe Mathis is an innocent victim of all those who cried wolf before him; more likely, he's making it tougher for the next athlete who gets legitimately screwed.